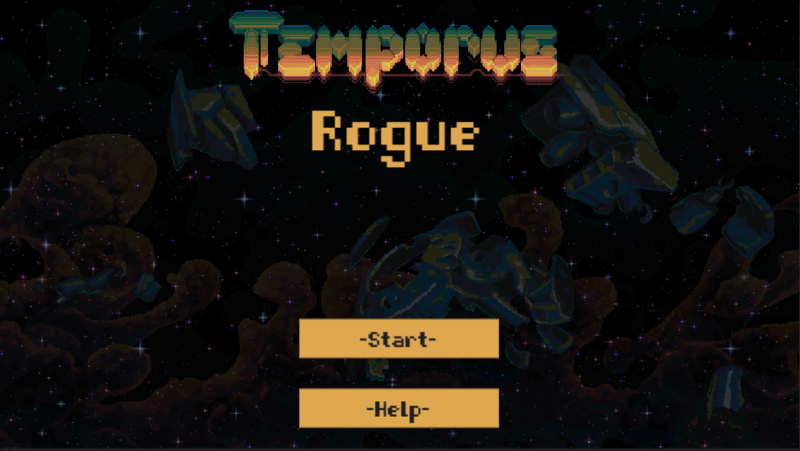 In Temporus: Rogue, you're flying a spaceship around to different locations and then going on missions to collect artifacts. 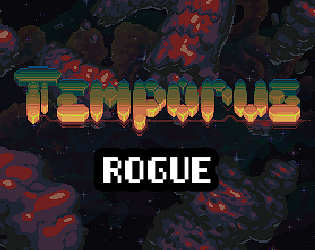 The thing that stands out immediately is the art: a mix of super low resolution pixel art tiles, non pixel-art effects, and awesome color choices. Keep in mind this is an update to a prototype that seems to have been made about one year ago, but it sounds like a good bit of effort went into the changes this year. The game feels a bit incomplete considering how long it's been worked on in total. There's a Help button on the main screen, but it only tells you there is no in-game help! I ran into several cases where my character became unable to move and then several other freezes. I couldn't make heads or tails of how to properly and repeatedly use the melee/range attacks. 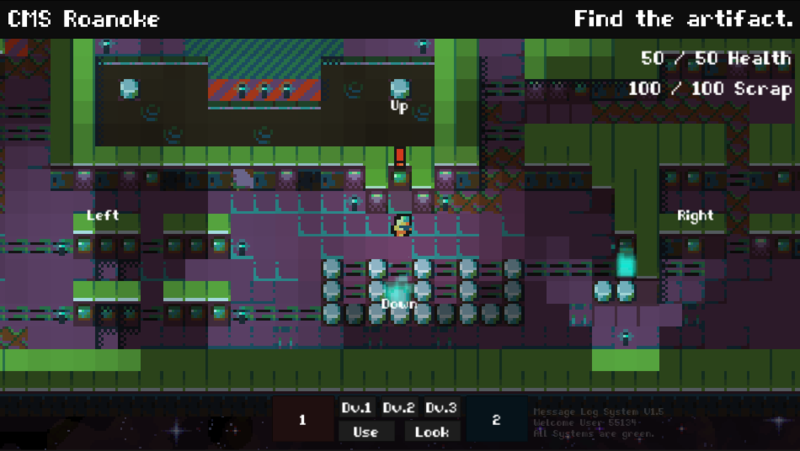 I couldn't figure out a way to progress beyond a single infinitely repeating mission to "Find the artifact", but I would guess that is all there is currently. Perhaps I've just done a poor job of understanding the game, so take all of this with a grain of salt. In spite of that, there's some interesting ideas at play here. You can set down drones to fight for you. I was confused why the drones didn't move, but it made more sense once each mission shifted into a time survival mode and you had to fight off waves of enemies. When I say "waves" though it was usually just 1 or 2 enemies. The difficulty is undertuned. Outside of the waves, the primary enemy only seems to attack when you do (and there's no need to kill them). There are also enemies (or friends?) trapped in "stasis fields". Supposedly they can be freed in some way, but I could only ever destroy them. Stylistically, this game is quite excellent, in both title graphics and actual game graphics. In terms of controls, it's okay - I tried the touch controls for a while and then switched over to the keyboard for movement, a step up on PC. I assume it plays better on Android, considering it's designed for it more than PC play. (If I had more room on my phone I would have played it - alas, no room). In gameplay, I found it quite fun - though I wasn't sure if the interface scrambling on the first location intentional or not. It was nice to have a goal beyond "murder everything" and the drones added an extra layer of strategy when at an artifact with multiple moving monsters. My only major drawback in playing was on one point returning to the ship, after my third artifact, the game unexpectedly crashed. I love the look and feel of this game. 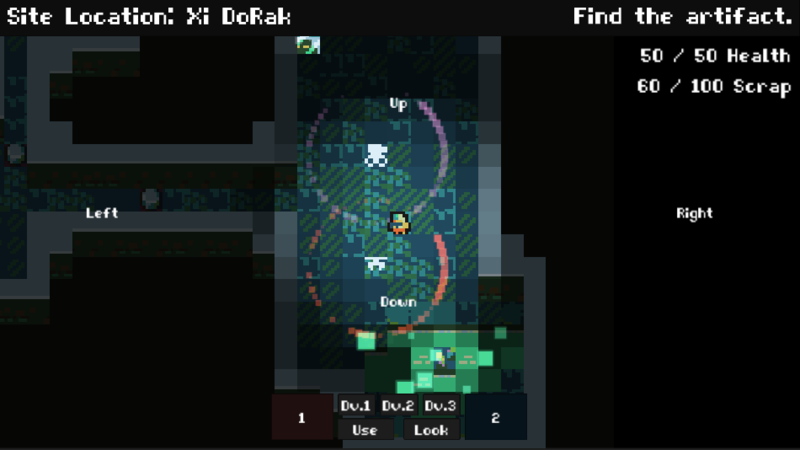 Definitely a roguelike. I like the drones. I wanted to like this game a lot more, but it took a really long time to figure out what was going on without any instruction or obvious way to start the game. (It's the matter transporter) I also ran into a number of bugs where I just froze and could not move. Also ran into trouble when placing drones and ended up blocking myself in - this could be a feature I guess (?) but it's really frustrating. The style and music is great. I love the tactical positioning of drones - this is a really interesting feature. For example, using a block barrier to push an enemy into the direct XY-line of your Dv2 drone is a great feeling. Also getting an enemy stuck right in the intersection of two Dv1 drone firing circles is very satisfying. These types of mechanics can be the backbone of a really great and interesting game.